Tap on calculator display to copy/paste. Paste option will be available only if there is any value in clipboard. Swipe horizontal on calculator display to access past values. 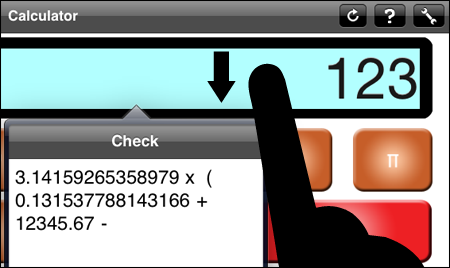 Swipe vertical on calculator display to check operands and operators entered before hitting ‘Equals’ button. 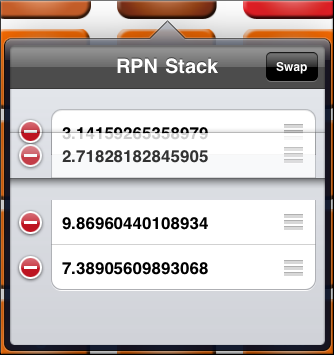 If ‘RPN Mode’ is enabled then RPN stack will be shown. Press once to delete last digit. Press and Hold to clear the content of screen. Example:If we have 5 balls of different colors then select 3 balls, number ways we can achieve this without repeating same color combination (5 nCr 3) = 10. Modulus/Modulo:This operation finds the remainder of division of one number by another. 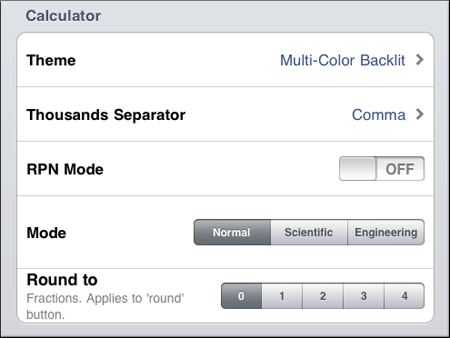 Convert to Exponential/Scientific notation:This button can be used to convert any number to scientific notation. Round Function:This function can be used to round off number with decimal places to specific number of decimal places or to Integer. Round to number of decimal places can be configured in ‘Settings>Calculator>Round To’. M+ : Adds value to memory. M- : Subtracts value from memory. MIn : Memory In. This button saves/replaces value in memory. To clear memory, use MIn when zero on display. RPN (Reverse Polish Notation):The main advantage of RPN is that it eliminates the need for parentheses that are required for expressions. In RPN the operators follow their operands; for instance, to add one and two, one would write “1 2 +” rather than “1 + 2”. Interpreters of Reverse Polish notation are often stack-based; that is, operands are pushed onto a stack, using ‘Enter’ key. Stack also permits the automatic storage of intermediate results for use later. 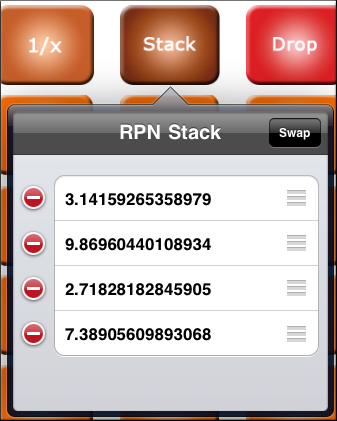 CalcMadeEasy’s innovative RPN calculator gives direct access to stack so that users can delete/reorder/swap operands onto stack, making it easy to manage Stack. 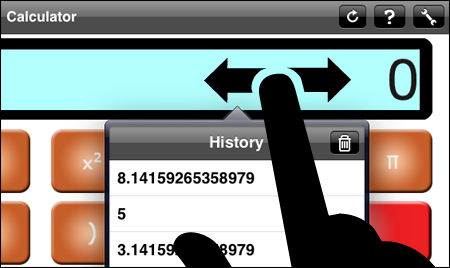 Swipe vertical on calculator display or click ‘Stack’ button. If no value pushed/entered then stack will not be shown. In ‘RPN Stack’ values can be deleted or reordered, see picture below. Overflow: Number too large to handle. Underflow: Number too small to handle. Sound, Theme and other options are available in App Settings.